family | Sprechen Sie Sassy? When we announced we were moving, we invited anyone and everyone to visit us here. Our brother-in-law is a USAirways pilot who wasted no time bringing our niece on a German adventure. Everything was still new to us, so I was unable to answer a lot of their questions and I was (and still am to a certain extent) a nervous driver. But I’m confident they had a great time. And: they unknowingly helped us as their visit framed itineraries for those who followed them. We stayed local the first day and explored Wiesbaden and neighboring Mainz. Dominic was excited to see he had his own museum! 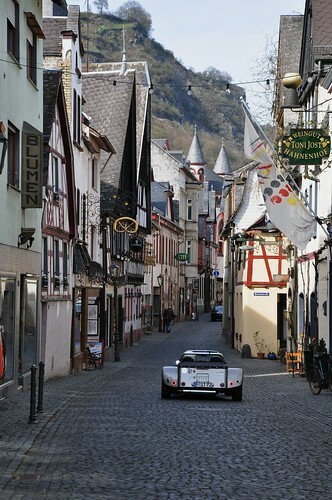 I was at a bit of a loss when it came to day trip planning; thankfully, our neighbor Dana suggested driving up the Rhein River Valley to her favorite town, Bacharach. It was on this drive that the GPS told me “Turn left in 500 meters. Then, take the ferry…” for the first time. But we figured it out and had a great day. 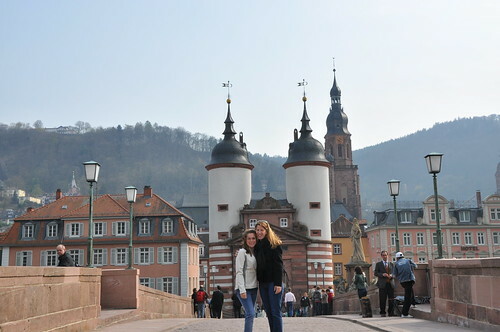 Day three had us in Heidelberg as I knew the route, shopping and sites would be fun and easy to navigate. 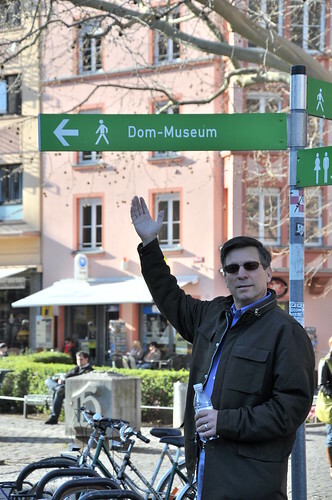 Big D joined in on the final day of their visit – we rode the train to Frankfurt for more exploring, shopping and eating. 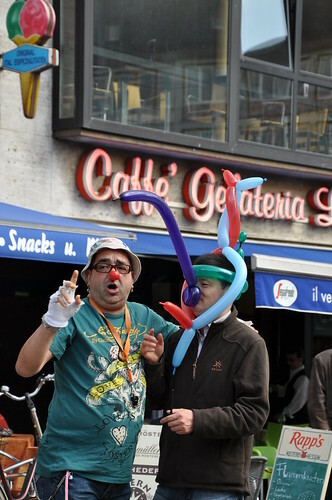 This performer gave a hilarious, wordless comedy and magic routine, communicating only through whistles and the squeak of his red nose. He’d stop people as they strolled by and incorporated them into his act. We were throughly entertained while trying to remain invisible so we didn’t become part of the show. It worked, and we were happy to toss a few Euro in his hat at the conclusion. More photos from Dominic & Alexa’s visit are over on Flickr.